Through my own research and experiences with the practice, I hope to offer readers a guide to incorporating yoga into their day-to-day lives in ways that are, as Dr. Deepak Chopra says, easy, comfortable and enjoyable. A Chopra Center Certified Vedic Educator has released a practical guide to understanding the core principles of living a yogic lifestyle, both on and off the mat. In “Going Beyond the Pose: Using Yoga as a Compass to Orient Your Life Toward Happiness,” author Kathleen Nitting presents readers with a modern view of the ancient science of yoga and couples wisdom from great sages and contemporary spiritual leaders with straightforward “Living Yoga” exercises and profound personal stories that illustrate the practice of being in yoga. Through her book, Nitting also offers her own personal journey to discovering a greater sense of wellbeing through alternative healing modalities and the development of a regular yoga practice. Ultimately, Nitting seeks to de-mystify yoga by identifying and explaining the four paths of the practice as a roadmap to living a life of balance: Bhakti (love and devotion); Karma (action); Jnana (wisdom and knowledge); and Raja (meditation). Diving deeper into yoga philosophy that has existed for several thousands of years, “Going Beyond the Pose” highlights just how relevant these teachings still are in today’s fast-paced, technology-driven world. 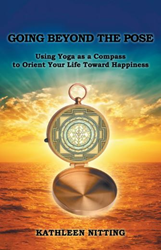 Along with Nitting’s passion for yoga, readers will take away simple tips and tools, and a rich dose of inspiration, to help create their own compass and navigate them toward fulfillment in all areas of their lives. Kathleen Nitting works at the Chopra Center as a Certified Vedic Educator and program host, where she teaches yoga, meditation and Ayurvedic lifestyle. Nitting also has more than two decades of experience as a writer, editor and public relations executive across industries including television, online education and international business development. She currently resides in Carlsbad, Calif. To learn more, please visit http://www.kathleennitting.com.